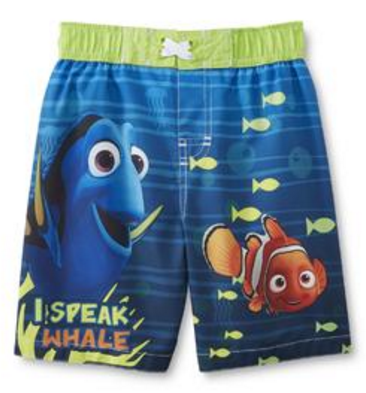 Finding Dory Toddler Boardshorts Just $8! Down From $20! You are here: Home / Great Deals / Finding Dory Toddler Boardshorts Just $8! Down From $20! Sears has these Finding Dory Toddler Boardshorts on sale for $8 (Reg. $20)! Plus shipping is FREE on orders over $35 or FREE in-store pickup! It’s fun to swim with two finned friends, as found on these toddler boy’s Finding Dory boardshorts from Disney Baby. A comfortable elastic waist has a decorative lace-up front just like the surfers wear. The colorful design features Dory telling Nemo “I Speak Whale.” With UPF 50+ sun protection and a relaxed fit, he can enjoy a long afternoon at the pool or beach.